Diamonds As Gifts: How Do You Pick The Right One? – Sig Nordal, Jr.
Love comes in different forms and different relationship dynamics. First, there is young love that is restless, magical, all-consuming, and ready to conquer the world. Then, there is mature love which is calm and ever-present. Just as love evolves, the little things that come with it should change, too. The unique gifts that remind you of how special you are should mature just like your relationship over time. Jewelry is the most versatile of all gifts you can give to your special someone. With its versatility, it can also leave people confused as to what it really means. Keep in mind that every jewelry design calls for the right time and the right situation. These diamond buying tips can help you decipher that. Let us start with young love. You are a new couple and your relationship has attained a certain stability. Aside from Valentine’s Day, New Year’s Eve, Christmas, and birthdays, you are going to get quite a few opportunities to buy gifts. The rule of love says that you should exchange gifts frequently to express your appreciation. You don’t have to go all out on one occasion. Instead, spread out your budget for at least ten events throughout the year. Diamonds are everyone’s best friend and you can easily find several designer pieces that will fit those events. You may also get numerous choices within your budget. But beware as not all diamonds are created equal or priced according to their quality. To avoid paying more than you have to, expert MichaelFried recommends buying only GIA Certified Diamonds and AGS Certified Diamonds. For her birthday, choose diamond stud earrings. You can go for colored diamonds if you know her favorite color or her lucky color. You can also go with a stylish pendant that she can wear regularly. If you wish to buy something for regular wear, pick a metal like gold or platinum that is hypoallergenic. Titanium is also a good option. If you want something dazzling yet personal, go with a diamante charm bracelet. With a little time in hand, you can design the charms to signify her hobbies, interests, and passions. Buying a charm bracelet is a great gift idea for your mom, sister, aunt, best friend or even your grandma. As long as you know their hobbies, likes, and dislikes, you can easily impress them with your jewelry choices. 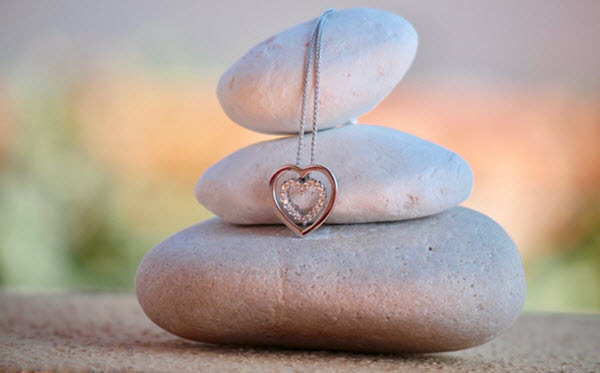 Pick a pendant for your mom if she has expressed a desire for one over the years. Pick diamond studs for your grandma if you know how she misplaced her first pair. Jewelry as a gift allows you to touch the lives of the people who matter the most to you. If you are not yet ready to settle down, picking the right diamond jewelry as a present can be challenging. However, traditional holidays and anniversaries bring forth the need to buy the same at least five times each year. Play safe with something personal yet neutral like diamond hoops, sleek diamond necklaces or even a statement pendant that goes perfectly well with evening gowns. Knowing what she likes and what she wants is the best way to woo her all over again. Living together for years has probably added more charm and beauty to your relationship. That is what your choice of diamond jewelry should convey as well. Though gifting a ring to a woman before you are ready to propose can be a risky move, giving her one after years of living together is just super romantic and cute. You can add lots of romance and love to the occasion with a stylish and splendid promise ring. Do not forget to engrave a few loving words to give the item a personal touch. For the more conventional lovers, diamond studs, bracelets, and pendants are great options for immortalizing any special event. Do not wait for an anniversary or a holiday to pamper your beloved. Seize every opportunity you get to remind her how lucky you are! The thousands of available designs and their pocket-friendly prices are now making it possible to do just that. Diamonds can dazzle anyone’s senses and they are the best gifts for any occasion! The post Diamonds As Gifts: How Do You Pick The Right One? appeared first on Dumb Little Man.